Authors should follow the manuscript submission instructions in website http://www.editorialmanager.com/jcsc/. Manuscript should be prepared in grammatically correct English. Detailed instructions are given below. Papers must present results of original work as a Regular Article or Rapid Communication. Critical Reviews of important fields and Perspective articles in emerging areas will also be considered for publication. Authors must also submit a covering letter explaining the novelty of the work, mandatory for Rapid Communication, and suggest 2 to 3 names of Referees. Submission of the manuscript will be held to imply that it has not been previously published and it is not under consideration for publication elsewhere; and further that, if accepted, it will not be published elsewhere. The Jurisdiction for all disputes concerning submitted articles, published materials, subscription and sale will be at courts/tribunals situated in Bengaluru City only. Text should be typed double spaced with 1" margin on all sides in Microsoft Word Format along with embedded Figures, Captions and Tables distinctly separated from the main text. 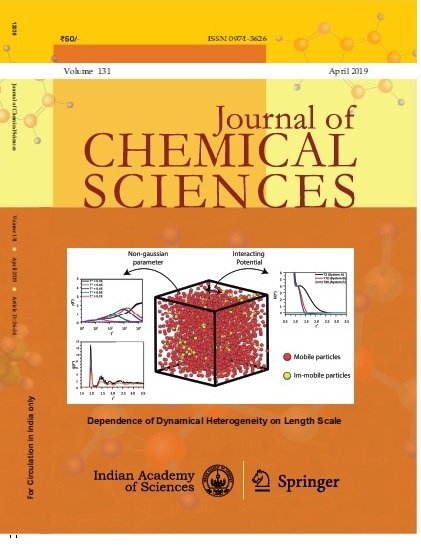 Please consult editorial staff at 'chemsci@ias.ac.in', before submitting manuscript in any other format. The title of the paper shall be short and seft-explanatory. Name(s) of author(s) with initial(s) and the name and address of the institution where the work was done must be given. Present address(es) of author(s) may also be given if different from the above. Email-id and contact phone number of corresponding author must be given. A Running Title of not more than 6 words must be given. All papers must have an Abstract of not more than 200 words. Presentation of numerical results should be avoided as far as possible. If the manuscript is accepted, a Graphical Abstract (See examples below) consisting of text not more than 50 words and a suitable figure or equation is required. 3 to 6 Keywords must be provided for indexing and information retrieval. The manuscripts of Regular research articles must be divided into sections consisting of Introduction, Experimental or Theoretical/Computational, Results and Discussion, and Conclusions. Main sections should be numbered 1, 2 etc., sub-sections as 1.1, 1.2 etc. and further sub-sections as 1.1a, 1.1b etc. or 1.1.1, 1.1.2, etc. Use of SI system of units and symbols is recommended. All Tables must be numbered consecutively in Arabic numerals in the order of their appearance in the text. Tables should be selfcontained and have a descriptive title. All Figures including photographs should be numbered consecutively in Arabic numerals in the order of their appearance in the text. Figure captions must be also typed on a separate sheet. Line drawings and structures should be made using suitable software like ChemDraw, IsisDraw, etc. Lines must be sufficiently thick for reduction to a half or third of the original size (0.3 mm for axes and 0.6 mm for curves are suggested). Symbols and equations should be carefully checked by authors for correctness in the manuscript and also in the PDF file prepared by Editorial Manager. Equations must be clearly written, each on its own line, well separated from the text. All equations must be numbered consecutively in Arabic numerals. Authors must check wherever special characters (Greek letters, vector, tensor, matrix etc. symbols) are used. For example, vectors must be in bold letters. If special characters are used extensively then an explanatory table of Symbols in a separate page is recommended. References should be cited in the text as superscript numbers in order of appearance. References should be listed at the end of the paper in serial order to match their order of appearance in the text. References should be typeset in the following manner. See examples for Conferences, etc in the URL given above. Authors are encouraged to submit extensive Data/Figures/Tables and scanned copies of original spectra in Supplementary Information. For newly synthesized molecules, it is mandatory to submit scanned copies one or more of the following spectra/reports, as applicable: NMR (1H, 13C) spectra; ESR spectra; CIF (converted to WORD file) and CHECK CIF files for the crystal structural analysis (in addition to CCDC numbers); mass spectra; combustion analysis reports; etc. Figures and Tables in SI are to be labeled as S1, S2, etc. The content of SI shall be described briefly in a paragraph in the manuscript after 'Conclusions'. See a Sample file in Journal URL. Authors should prepare the original/revised manuscript carefully in order to minimize corrections and alterations at the proof stage. Proofs will be sent as PDF files to the Corresponding Author. Corrections should be sent by email either as a serial list of page, column, para and line numbers or as annotated PDF file.